The city of Oviedo, starting point of the Original Way to Santiago and also a main city along the Northern Way, has been an important attraction to pilgrims for centuries. The Holy Chamber in the city’s cathedral, San Salvador, was home to many important religious relics that made Oviedo an important destination for Christian pilgrims: those travelling from and to Santiago but also for those coming to Oviedo specifically to see its relics, walking the route from León to Oviedo. The Holy Chamber of Oviedo, the pre-Romanesque church part of the Cathedral, dates back to the 9th century and is today a UNESCO World Heritage Site. 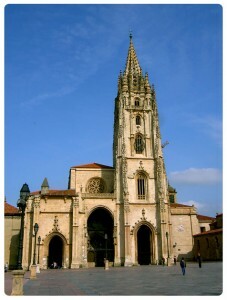 There is a saying that illustrates the traditional importance of Oviedo as a pilgrimage destination: ‘Quien va a Santiago y no al Salvador, visita al criado pero no a su Señor’, meaning ‘Those who go to Santiago and not to Salvador (Oviedo), visit the servant (St James Apostle) and not the Lord (Jesus Christ)’. The pilgrimage walking trail to San Salvador in Oviedo takes about 100km and goes from León to Oviedo. Once in Oviedo, walkers can travel West to join the Camino Primitivo (Original Way) to Santiago or walk to Aviles and follow the stunning route along the Asturias coast on the Camino del Norte (Northern Way). However, while its many stunning churches and religious relics are an integral part of the city’s rich heritage and history, there are many more attractions for visitors walking to or from Oviedo. The city has an established University (1574) that gives Oviedo a lively buzz; it is also the home to many museums and theatres, as well as hosting the Principe de Asturias Awards (Spain’s own version of the Nobel Prize). When in Oviedo, you might discover Asturian bagpipe music and you should definitely taste Asturias traditional dishes such as ‘fabada’ (bean stew), ‘bollu preñao’ (bread bun baked with chorizo sausage inside) and some of the many seafood dishes. Make sure you don’t leave Asturias without having tried its famous natural cider (sidra) first, you will find it in any of the city’s many ‘sidrerias’. Ask your waiter to show you how it should be poured onto the glass, as there is a specific method, to make the cider taste better. And if you happen to visit Oviedo in September, you might be in luck to catch some of the biggest celebrations of the year: the Fiestas de San Mateo. 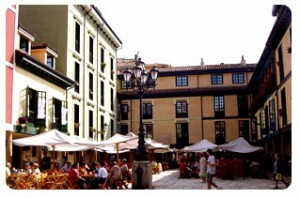 San Mateo is a week-long festival with concerts, fireworks and many activities for everybody, young and old. 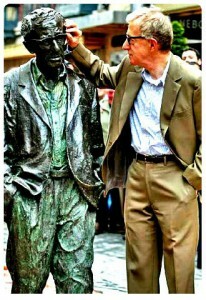 Did you know that film director Woody Allen is also a fan of Oviedo? part of his hit movie ‘Vicky Cristina Barcelona’ was filmed here and the city has a life-size statue dedicated to him. Woody Allen was also awarded the Principe de Asturias Award for the Arts in 2002.